Di Biase Hair Extensions USA is extremely grateful to our clients who have given us their ideas to help their fellow stylists in increasing their hair extension income. We fully appreciate and welcome any and all ideas that you may have to continue adding to this list. All of these were submitted from a variety of hairdressers around the nation and utilize unique marketing strategies to promote their hair extension business. If you have thoughts of your own that you might like to share we would fully appreciate hearing from you. Please email hints or questions to media@dibiasehairusa.com. * If you can, wear your hair extensions as a stylist. Having them in your own hair helps show the client then and there what it’s like to have extensions and builds trust between you and the other person. Try to get others in your salon to wear them and talk about them. * Work together with other reps of beauty businesses in spreading the word about your business. Examples include Avon, Pure Romance, Mary Kay. * Throw little meet and greet or demo events to explain how extensions work to others and go over the different types of hair and methods of application. These can also be for other stylist or clients. * Do small teasers with a fun color or fill-in on the sides of the head to show how extensions help to give fullness as well as length. * Put extensions in a bartender’s hair and have them show their hair off at work. By doing this, they are creating a conversation starter with the many people that they serve. *Run colored extensions as a fundraiser. That will help raise money and gain extension awareness. *Use the Mirror Clings in your salon to introduce extensions to people who might not know what they are yet. *See if you can display one of the Di Biase posters in your salon. People notice it and may start to ask questions about extensions. * Offer to put in a couple bonds into someone hair who might have thinning hair, thyroid issues etc. This will give them an idea of how it might be to have more hair and will typically want to try even more afterwards. * Advertise on the salon social media pages page and post before and afters. Make sure that you include the hashtags #dibiasehairusa or #dibiaseextensions and tag Di Biase so that we may share it with our clients as well. * Take Di Biase’s advanced class and then become a part of the American Hair Loss Council. Broadcast this to your clients. Contact dermatologists in your area and let them know you can make a difference with some of their clients. * Ask potential clients to check out the Di Biase website and social media. * Put a mirror cling in the back window of your car with contact information. * Have a printout ready for all clients that explain the extension process along with the breakdown of prices. If you are able to explain how extensions work, it is more likely that they will order extensions from you. * If the stylists that wear extensions at the salon send me two extension clients, I put their extensions in for free the next set. I usually charge them $100-$200. You should never do extensions for free unless you trade services. * No matter where you are, try to bring up extensions in some way. Show people how passionate you are about your work. This will radiate and others will become interested in looking into transformations for themselves. * Play a slideshow of your extension work on an iPad at your station every day. This catches not only your client’s eye in my chair but the other stylists’ clients who are walking by my station. * Work bridal expos and any type of event around the community that women attend. Put extensions in a model while this is going on to show how they work. * Cross advertise with a boutique or store next-door to the salon in order to promote both of our businesses. * Take your color ring with you everywhere you go. This way you can do consultations on the spot, no matter where you are. * Advertise if you have the budget. This can be through magazines, online or any advertising medium that fits your audience. * Create nice looking brochures and flyers to hand out when people ask about your salon or hair extensions. Hand out your cards stating that you’re a professional extensionist at every opportunity you have. 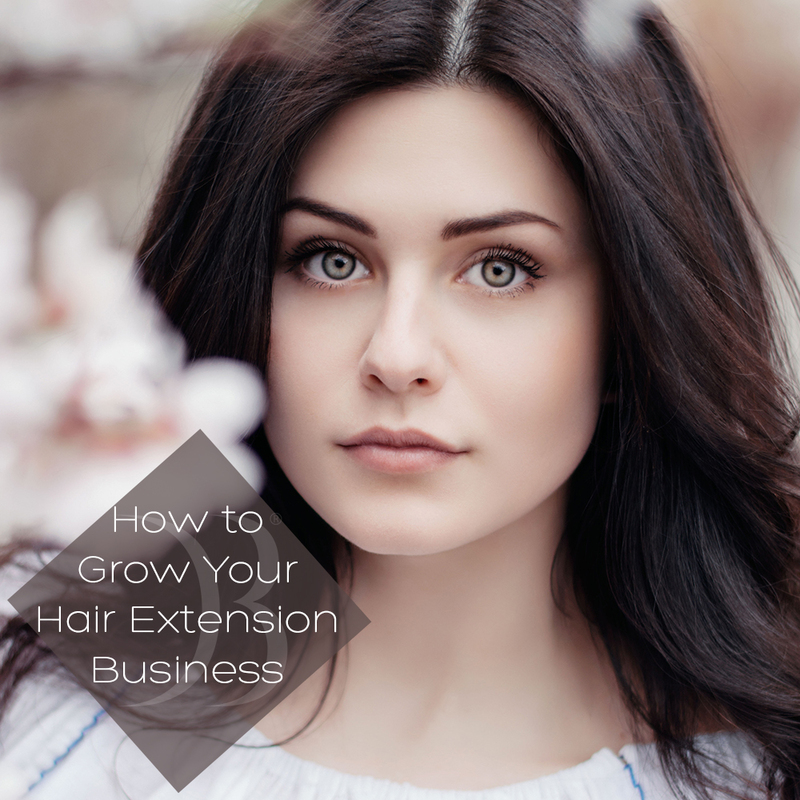 Many people focus on how to get new clients in for full heads of hair extensions, but it doesn’t have to be where you count on your extension money coming from. Consider focusing on a much smaller price point, which is a much easier sell. Clients complaining about the thinness of their hair, or the lack of defined layers in their hairstyle are actually prime candidates for hair extensions. The smaller selling price for partial heads is much easier for clients to wrap their head around. When you have a client complain about a hair issue you could fix with extensions, that’s your way in. Follow up with phrases like: have you considered trying hair extensions to solve that? Did you know hair extensions could be used to add thickness without needing to add length? Has anyone ever told you about using hair extensions to fill gap layers on fine hair? Your partial head hair extension clients are actually your best marketing tools since they are the ones who will be referring other people to you. Whatever method you choose, stay open minded and creating in your marketing strategies. The same thing that worked for one person might not work for another so don’t get discouraged. Most importantly, keep expanding your client base and don’t settle. Good luck to you all!